For decades, cities have regularly inspected restaurants to ensure food safety, providing this information publicly to citizens. Unfortunately, this information is often buried on clunky “dot gov” websites beyond the easy reach of consumers. Or equally inconvenient, it’s accessible in the offline world, displayed somewhere in the physical business, and not always obvious to the diner. When we launched the LIVES program in 2013, our goal was to increase access to this critical information by working directly with local health departments to bring this data onto Yelp and putting it in front of consumers while they are making a decision about where to eat their next meal. Today, we are thrilled to announce that we are taking our LIVES program national. Over the last five years, we have been able to add health inspection information to more than 200,000 business pages, both in partnership with local governments and by working with HDScores, which maintains a nationwide database of health inspection reports. Now, that number will more than triple as we work to incorporate more of the HDScores database, which covers three quarters of the US population across 42 states. 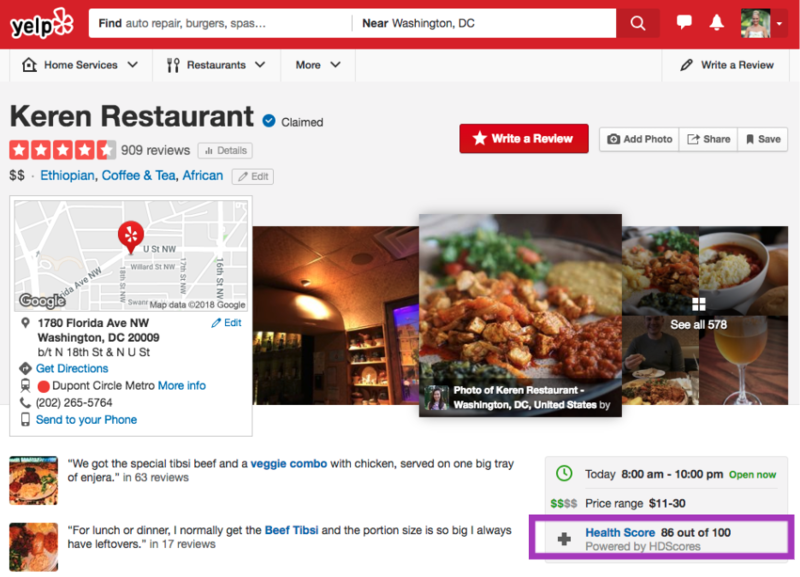 Today we have added health inspection data to Yelp for more restaurants in New York, California, Texas, Illinois and Washington, DC, and will continue to roll out updates state-by-state in the coming months. Our goal has always been to give consumers as much information as possible about local businesses. We know from a study of the Los Angeles restaurant industry that when consumers have better access to restaurant hygiene scores, the number of hospitalizations due to foodborne illness drops, and best practices improve across the industry. Just this year a different study found that posting restaurant hygiene scores prominently on Yelp leads to a 12% decrease in purchase intentions for restaurants with poor scores relative to those with higher scores. As we continue to grow the LIVES program on Yelp, we hope to see positive effects both on the restaurant industry and for consumers by making this data available where millions of people are already coming to find information on local businesses.